The latest restaurant to join the group is Modern Shanghai, which brings authentic recipes from the region and serves them in a homey, comfortable environment. It joins Watami, a top food and beverage restaurant in Japan, the first Village Tavern branch outside the US, and Japanese-Western restaurant Ma Maison. These four are the latest international chains brought to the Philippines by The Bistro Group, rounding out its restaurants. Aside from new dining locations, the arrival of Chef Boutwood has seen the launch of new dishes, such as Black Pizza, Sesame Teriyaki Chicken Wings, and Fully Loaded Sweet Potato Skins at Village Tavern, and the a la carte Katsu Menu at Ma Maison. As a way of saying thank you to loyal customers, The Bistro Group is also launching the Premiere Card, which offers multiple discount offers up to 40% off the total bill; complimentary appetizers, coffee, and tea; as well as birthday treats for the cardholder. 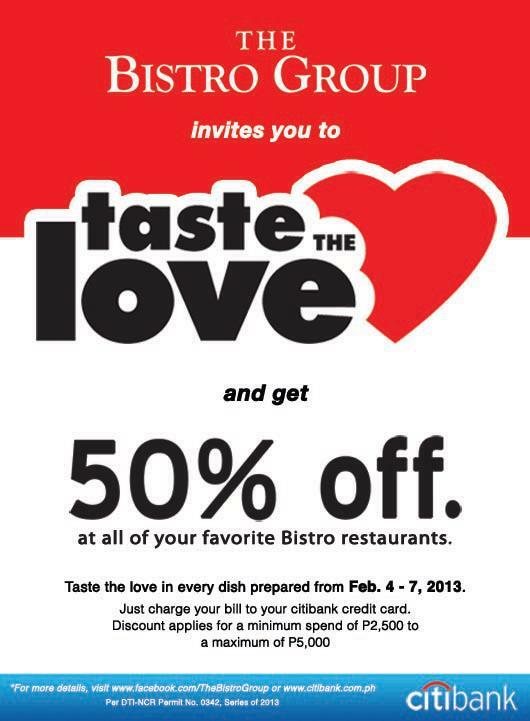 In addition, for the month of hearts, The Bistro Group is offering an exclusive deal for Citibank cardholders. From February 4-7, cardholders will receive 50% off food and beverage orders worth at least P2,500, with a discount up to P5,000. 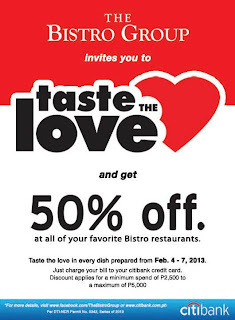 “We invite everyone to Taste the Love at the Bistro Group of Restaurants and to stay tuned as we roll out even more exciting deals, menu items, and restaurants in 2013. We are excited about what we have in store for our customers, and with great food, great service, great ambiance, what’s not to love?” Ronquillo states. 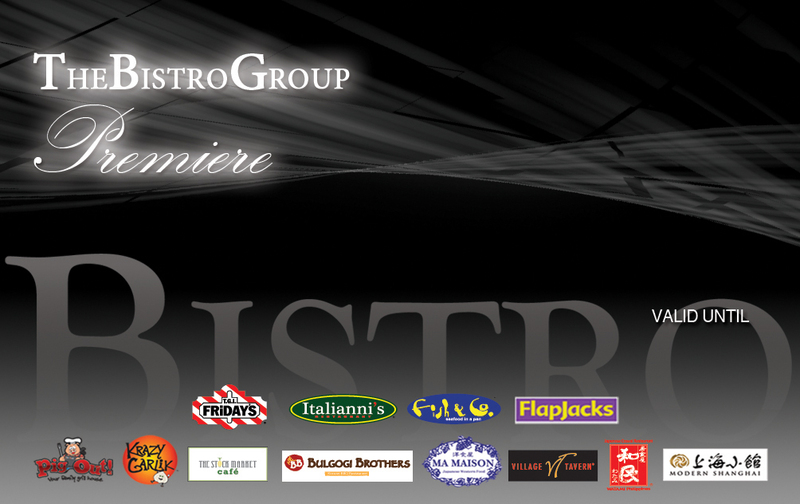 The Bistro Group is a collection of international hospitality casual dining brands and home-grown restaurant concepts, namely TGI Friday's, Italianni's, Fish & Co., Flapjacks, Pig Out!, Krazy Garlik, The Stock Market, Bulgogi Brothers , Ma Maison, Village Tavern, Watami, and Modern Shanghai.